I like the anecdote that tells the story of the great guitar teacher (I can’t remember who it was) being asked how long it might take to learn to play ‘Leyla’ by Eric Clapton. The reply was – ‘about 12 hours’. The follow up question concerned a movement from a lute suite by Bach – “well how long to learn this?” The reply was, to the interlocutor, devastating; “about 12 years”. I mention this because a couple of weeks ago I was playing a repertoire I have worked on for five or more years comprising Bach, Dowland, Britten and others. I was performing at Art in Action in Oxfordshire, the idea being to play outdoors for the general ambient entertainment of all. I had played for a few hours each day and people pleasantly nodded to me as they meandered by. I was suddenly confronted by a smiling Spaniard who gestured that I might let him look at my guitar. This was not comfortable. The guitar is a 1974 Ramirez 1A and valuable and is in almost perfect condition. The man took it from me and said he would play. “I play too!” he announced. He did and regaled us with a horrible rending of some cod flamenco based around a few variations on “Soledas’. It was simple stuff but he was what I can only describe as a guitar masher. His builder’s hands pulled the strings around and off the notes, his rough right hand and long nails rasguardo threatened the soft belly of my instrument and he made the grungiest sound ever made on that instrument. I feared for my instrument. You will imagine my feelings when after three days of playing to a more or less indifferent crowd, this roughneck got a large round of applause from far and wide. With a wide grin he handed my guitar back to me and I resumed the Prelude I had interrupted. The crowd went back to its business unpeturbed. A secondary note – a little away from me a small crowd gathered around a young artist who was sitting in the open air with a sewing machine. They stood and watched with looks and gasps of awe. 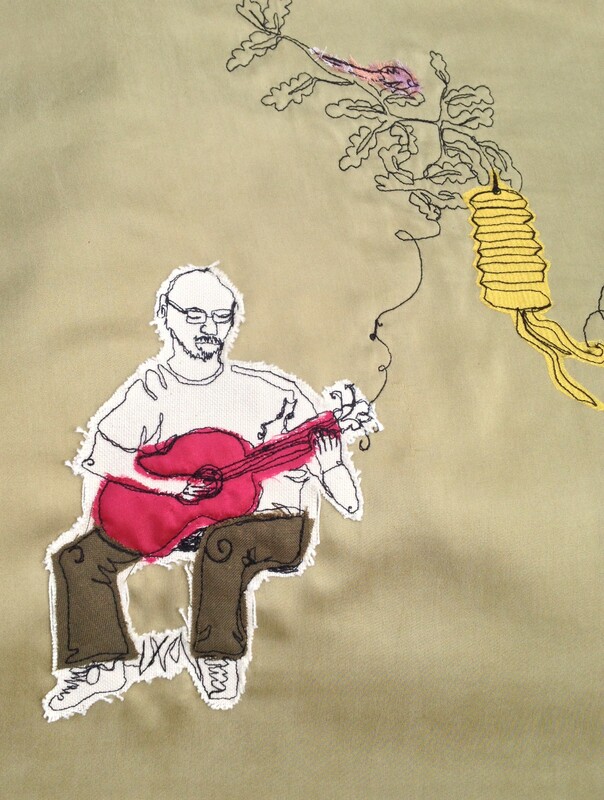 The artist (Harriet Riddell) sketches people with a sewing machine – hard to imagine so here above is the image she made of me as I played….